Top Ten Quotes: Less Chaos. Less Noise. In 2010 a friend handed me a copy of Kem Meyer’s Less Clutter. Less Noise. What was written as a book on church communications turned into a spiritual gut-check for me. I was reminded that it is all too easy to hide behind calendars and inboxes and to-do lists instead of creating space to value be over do. So when Kem released the revised and expanded edition last year and rebranded it Less Chaos. Less Noise., it took me all of 42 seconds to decide that I needed a second copy and a second read. If you’re not a part of a communications team, don’t let that stop you. Pastors and admins and volunteers and business types need to digest this content. How often do I draft my correspondence, seemingly harmless enough, without concentrated consideration as to how it makes the recipient feel? Do I test my words against the objective I’m trying to accomplish? It’s easy to judge people who are not like me. It’s easy to dismiss people who act in a way I just don’t understand. It’s also easy to slip into this complacent mode where I think, “I’ve got it all figured out.” When that happens, my unsolicited sermons into those people’s lives are destructive because I don’t have all the information. I end up keeping score based on my own personal worldview – a worldview that lacks important context outside of my individual walk. Connect [information] with a felt need, and you will connect with an audience. On the other hand, if you share information without wrapping it around a felt need, it is almost impossible to make a connection. Remember, it’s easy for people to miss what they’re not already looking for. If [announcements are] not affecting the masses, it’s just going to land like dead weight. Don’t punish the crowd to keep a few people happy (even if they are the most vocal). Don’t punish the crowd to keep a few people happy. @kemmeyer, Less Chaos. Less Noise. Anything that’s not critical to this moment physiologically is drowned out. It’s how God has designed the human brain to prioritize. People need inspiration first, so the information will sink in. How can I put my own best interests aside to foster a collaborative environment? What gifts can I give others, even if the “gift” is humor, understanding or knowledge. What else can I give? I believe the best team members are the ones who communicate what they think. There is no penalty for disagreement. We get ourselves into trouble when we take the top-down approach and prioritize policy over people. Governing every communication channel is impossible but synchronizing communications is very possible if you stay balanced and realistic. The yes behind the no? You can’t control everything, but if you focus on what you can control – and you’re good at it – you’ll influence others by your example. Be available. Open your door, come in the office, take off your headphones, walk around and don’t hide behind email or voicemail. 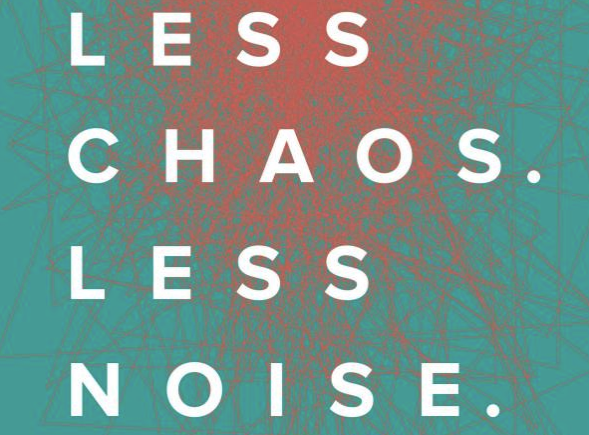 Order Less Chaos. Less Noise.